It is my first field night in the Kalahari, and I feel like I am wearing every piece of clothing I brought with me. My body is nice and warm except for my fingers and toes. They are permanently encased in iceblocks. As hard as I try, ensconcing them in wool gloves and socks, they never seem to get warm. Most people don’t realize how low the temperature gets in the desert, but it is bone-chillingly cold. The crunch of a raisin bag sounds across the sand, low shrubs, and thorns hanging at just the right height to leave a mark on your face. Suddenly, three furry faces appear and start prancing over to us. 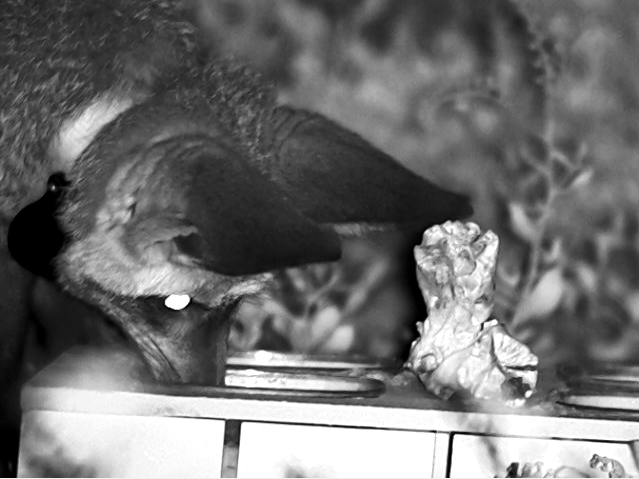 Three bat-eared fox (batty) pups have come to get their treat of sweet raisins. I am dumbfounded at how close they get to us. One little boy comes and pulls on my shoelaces. These animals are habituated! I’ve studied a number of species as a biologist, from humongous (300 kg) sea lions to thumb-sized (6g) pocket mice, but this is my first experience working with an animal that you can walk right up to and follow without them running away. To walk with the bat-eared foxes as they meander through the tall, thorned bushes, gobbling up termites and caterpillars is a truly wonderful experience as a biologist and naturalist. Most science projects that study individuals aren’t able to do something like this; they trap individuals every so often, take the necessary measurements and samples, and then release the animal into its natural setting. If you want to study their social behavior, you do so at a distance (so you don’t upset any natural behavior) at the cost of interaction details. My PhD on yellow-bellied marmots epitomized this approach. We trapped individuals every other week, took their weight and different morphological measurements, painted a unique symbol on them and let them go. I watched, from a great distance, as they played, fought, and ran from predators. My work focused on consistent differences in individual behavior — or personality — so it was imperative that I knew the animal I was watching and with whom they were interacting. This could be difficult at such a great distance and often the small details about their personality could be lost. The batty project allows me to study these social little animals so close that I can examine how one individual differs from another without worrying about losing much detail. I can tell who is biting whom, who’s growling, who’s whining… This approach does call for an ongoing process of habituation, though, as new (wild) individuals keep on coming into the population. So, next up is to habituate as many foxes as possible. This is a slow, tedious process, but totally worth it. I arrived in the Kalahari a year ago with the mission of testing the batties’ problem solving skills. They are rather small brained, so I didn’t expect too much. However, they surprised me in the first challenges I presented to them (opening puzzle boxes). Since my foxes performed splendidly with a simple puzzle, I challenged them a bit more with a harder one. Here they needed to a tasty raisin from one string with another string devoid of raisins. This would show these guys understand the connectivity of things and can reason “this end is connected to that raisin, but that one has nothing”. This is more common in birds, but rare in the mammal world. Only three foxes showed interesting in pulling strings as other resorted to their ‘know how’ of opening the previous puzzle such as trying to push the lid down. The interest was soon lost when this strategy didn’t work. After four months of seeing the three foxes pull baited strings I was finally done. One of the foxes was very smart and had a great success rate, but then immediately disappeared without a trace… The ones left behind performed a bit more poorly, just pulling whatever they see first regardless of its connection to a raisin. Well, I can’t say that these foxes don’t understand connections; so many other factors could easily have influenced their performance, such as their reliance on listening for their food. So far the verdict is still out of how smart these guys really are. My time here has now come to an end and I will seek another adventure that was as fun and exhilarating as wild bat-eared foxes. It was a long struggle to get the foxes to like me and now I have to leave them. I know I will miss them as if they were my own. Towards the end of winter, field work became a bit too predictable: I find my fox, we wander around, and end up more or less where we started. But the onset of the breeding season is causing more than romance to blossom, with batties popping up where they’ve never been seen, and unrest manifesting in previously calm neighbourhoods. The docile creatures that they are, I expected most of these changes to be genteel. In one case, however, a foraging altercation took an interesting turn. One of the areas I visit is home to an odd pair of foxes, Aristotle (Ari for short) and Scruffy. Scruffy is a particularly ill-kempt vixen. While I have no doubt that at least some of Scruffy’s problems are rooted in her thriving community of on-board parasites, I’ve slowly come to realise that part of her problem is Ari. There is just no way to sugarcoat this: Ari is an abusive husband. I’ve seen him chase Scruffy, nip her, snarl at her and just generally mistreat her for no apparent reason. He’s not the loving husband that batties are supposed to be. And it turns out that Ari just acts like a mean drunk in any context. One evening, Ari turned up unexpectedly while I was following Bruce. At first, Bruce sauntered off, pretty much ignoring this snarling new arrival. A couple of minutes later, Ari tried to muscle in on some ants Bruce was gulping down and suddenly all hell broke loose. Now I’ve seen battie “aggression” before: foxes approach each other, growl a bit, or make half-hearted attempts to give chase. But this night, the boys meant business. Bruce and Ari launched into one another, the perfect snarling, biting cartoonish dust-ball. I couldn’t tell one battie apart from the other. And then, in a few seconds, it was over. Ari was sent packing down the road, presumably back to take his frustrations out on his long-suffering wife. Bruce meanwhile shook himself off, and conscientiously urinated on anything in his neighbourhood that didn’t run away. This is the first serious fight I’ve seen in two months and it will certainly be interesting when we find out what hormonal changes are driving this behaviour. I can’t help wondering if the vagabond syndrome and serious aggression will become commonplace. Love (and War) are in the air.